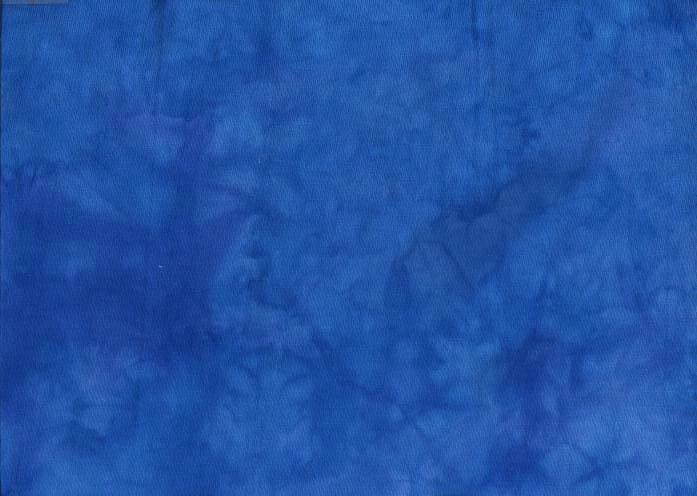 The point of low water immersion dyeing is to encourage complex variations in color, the same "imperfections" carefully avoided in bucket dyeing by the use of salt, large amounts of water, frequent stirring, and possibly the use of calsolene oil. The effects are more subtle and, to many, more beautiful than the effects obtained from direct techniques such as tie dyeing. This is quarter-size reduction of a detail scanned directly in at 60 dpi. To see the full-size image, click on the small image to the left. I found a 2.5 pound coffee can, and to prevent rust from contacting my fabric, lined it with a one gallon plastic bag, pulling the edges down over the outer sides of the can. I spread the shirt (a size XL Hanes beefy tee) flat on a surface and pulled upward on each of 6 or 8 different spots across the front of the shirt, bunching the short together at the sides, to make a shape that would fit in the coffee can easily, but with the very topmost layer of fabric drawn more or less evenly from across the garment. I mixed 1 scant teaspoon of soda ash (sodium carbonate) in 1 cup of water, then became concerned that this could not possibly be enough for the entire shirt, and added two more scant teaspoons. Of course, this much could not dissolve easily in a single cup of water, so I heated it in the microwave (two minutes, in a machine that takes two minutes and twenty five seconds to boil a cup of water. This was before I learned that soda ash dissolves better in warm water than in hot.) Stirring dissolved most of the soda ash. Next I added 1 tablespoon of urea and two teaspoons of fuchsia...half as much as the total of cerulean blue. (Cerulean blue does not need to be doubled in volume as turquoise does, to keep the ratios of dye amount by weight similar.) The fuchsia dissolved extremely well in the hot water. I poured it over the shirt, poked at the shirt a couple of times, then sealed the lid and left the dyeing to process overnight. The next morning, when I poured it off, the dye bath was very purple. However, upon washing out and drying the shirt the next morning, I found that it had only the sublest of purple markings, being almost entirely blue. I'd expected the blue and fuchsia to mix more and create more purples. Interestingly the markings are much more pronounced when viewed under artificial light, whether incandescent or fluorescent, then when viewed with natural sky light. What happened to the fuchsia? Clearly, the dye solution I added at the end penetrated the shirt thoroughly, as otherwise the blue would not have been fixed by the soda ash that was contained in the second dye solution only, and would have washed out. However, very little of the fuchsia dye reacted with the fabric. Hot water reacts almost instantaneously with dye, leaving no unreacted dye to bond to the fabric! I immediately decided to overdye the shirt in an attempt to make its markings more complex and interesting, but my husband instead claimed the shirt for his own to wear, as the colors are very pretty, and, he says, we could use some more subtle shirts around here. I had to use another shirt instead.